Yes, the core of being a good learning designer is creating good learning experiences. There are so many tools, so many ways to accomplish this that broad skills and understanding are the most important thing. This image, the T Shaped SkillSet by Cammy Bean is right on target. Link to full article is below. Yes. Wonderful article by Josh Bersin – a realistic article. Today’s new learners want embedded learning, bite sized, easy to access. And surprisingly, although research points to this need and desire by learners, business leaders still cite the “need for improved organizational learning.” Josh says it all. Though my focus is always andragogy (adult education, coined by Malcolm Knowles) I often make the argument that more and more often the line between pedagogy and andragogy is blurred. This article brought me back to some fundamental differences. Regardless of information accessibility and immersion in special interests, very few people under 17 have the job relevance – thus the immediate application of new learning in context – so I remain on the fence about this. 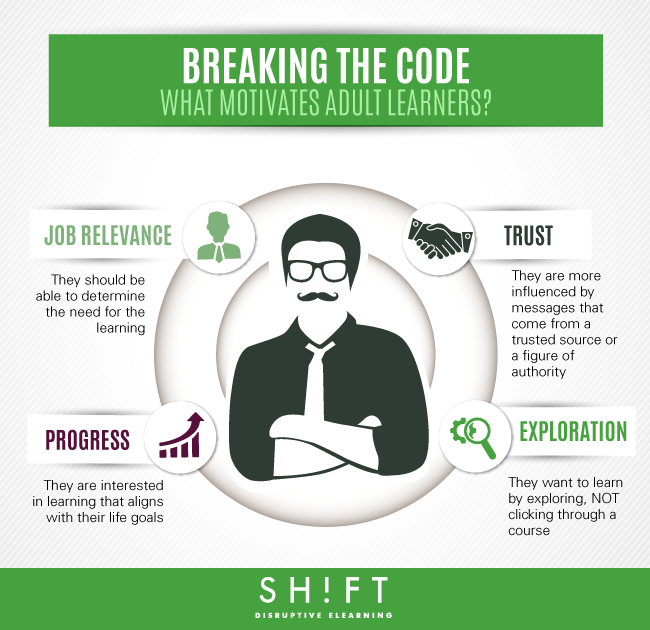 Source: Breaking the Code: What Motivates Adult Learners? This is a great article as we enter an age when we are not sure of jobs and functions that will be replaced with artificial intelligence. No question it is happening now and will continue to happen. But what about when it breaks?